The Ulster Defence Association (UDA) says it has put its weapons beyond use. The decommissioning process is understood to have taken place in recent weeks. The loyalist paramilitary group was five weeks away from a government deadline to complete the decommissioning of its weapons. Once this amnesty ended, any UDA weapons discovered by police could have been forensically tested and the evidence used in court. 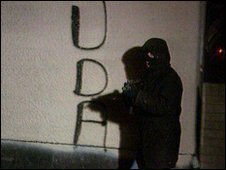 The UDA and the Ulster Freedom Fighters (UFF) , a cover name it used for its paramilitary activities, are suspected of being behind 400 murders between 1971 and 2001. A second, and older loyalist group, the Ulster Volunteer Force (UVF) completed decommissioning in June last year. On 9 February, the legislation that allows the decommissioning body to operate ends. Any UDA weapons that would have been found after that would have been forensically tested. Evidence gathered from that could have been used in future court cases and possibly secure convictions. At the moment if members of the UDA have a certificate saying they were moving weapons from one arms dump to another for decommissioning there is an amnesty, as it were. The government has made it clear that the UDA would be treated as common criminals after the legislation expires and that police would actively seek their weapons. The UDA statement was read by Frankie Gallagher of the UPRG - the Ulster Political Research Group, a body which provides political analysis for the UDA. He said: "Today, the leadership of the Ulster Defence Association can confirm that all weaponry under its control has been put verifiably beyond use." He categorically denied that the decommissioning was bought with the offer of government investment in loyalist areas. Relatives for Justice, which speaks for some relatives of UDA murder victims, said families were "not interested" in UDA decommissioning but instead "want the truth about collusion between these loyalists, how they were armed, infiltrated, directed and controlled to carry out hundreds of sectarian killings and political assassinations." The decommissioning was confirmed by General John de Chastelain, who witnessed the act as the head of the international decommissioning body. He said it was "a major act of decommissioning" in which arms, ammunition, explosives and explosive devices were destroyed. He added that the leadership of the UDA told him that the armaments "constitute the totality of those under their control." The decommissioning was also observed by independent eyewitnesses, Lord Eames, the former Archbishop of Armagh and Sir George Quigley, the former chairman of the Ulster Bank. They said: "We were very pleased to have the opportunity to be present at such a significant moment in the course of Northern Ireland's steady progress towards what can be a far better future for everyone." They added that loyalists who had renounced violence and criminality, and who wanted to help transform their communities, needed to be supported. The move comes more than 15 years after the UDA announced its ceasefire and 12 years after the Independent International Commission on Decommissioning was set up. A breakaway UDA faction in south east Antrim decommissioned a small quantity of weapons last summer and told General De Chastelain it would also complete the process before the February deadline. The body which monitors paramilitary activity in Northern Ireland said in its last report that the UDA remained split into two distinct groups - the mainstream UDA and the south east Antrim group. The Independent Monitoring Commission said in November members of both factions remained involved in a range of criminal activity.